Ruben's Baseball: What's next for Colin Moro? What's next for Colin Moro? Colin Moro has done it all. From winning championships in the city he grew up in, having the opportunity to play with his childhood favourite team’s jersey on his back, getting a baseball scholarship, to winning Rookie of the Year and all-star awards. But as spring approaches this player who has always had baseball in his blood is looking for a place to play this season. Growing up Moro played for his local Little League and Babe Ruth teams in Calgary before going to the Prairie Baseball Academy in Lethbridge in 2003. After two seasons there he got a scholarship to play baseball for the LSU-Shreveport Pilots where he played until 2007. During the summers he played in the WMBL, winning a championship with the Calgary Dawgs in 2004 and again with the Okotoks Dawgs in 2007. These were huge highlights for him, both for winning a championship in his home town as well as the honour to be a part of such a great organization. In 2008, he started playing professionally, joining his hometown Calgary Vipers and instantly made an impact. He won Golden Baseball League (GBL) Rookie of the Year honors, as he led the Vipers to the Championship Series. 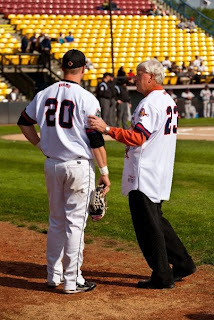 It was a great experience for Moro : “I remember how satisfying it was to be the starting centerfielder everyday and to be able to contribute to a championship caliber team”, he said, adding that in the deciding game, “standing on deck with a one run lead in the 8th inning I remember saying to myself that I was willing to do anything to keep the lead for just six more outs”. Alas, it was not meant to be and “it was absolutely heartbreaking to watch them score the tying and winning runs in the bottom of the 9th”, he lamented. 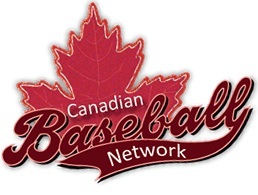 In 2009 he improved on his inaugural season, being one of the offensive leaders on the team, batting .376, garnering him GBL All-star recognition and sharing the Canadian Baseball Network’s Independent League’s Offensive Player of the Year honours. 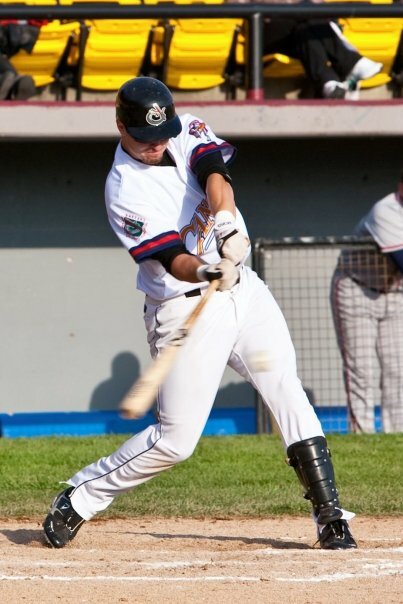 In the last semi-final game, down by a run in the 9th, the Vipers tied the game against Edmonton and then Moro crossed the plate with the winning run to send his team to the league finals again. This time, he led them to the GBL championship, giving his hometown team the distinction of being the first team in the league’s history to bring the trophy to Canada. “It was the most incredible year of my life”, Moro exclaimed, adding that he hopes “every ballplayer gets to experience that feeling”. In spite of his personal and team accomplishments, the highlight of the season may have been on a sunny Saturday in August when the Calgary Vipers hosted the Victoria Seals. The Seals owner was Russ Parker who had been the Calgary Cannon’s owner before that AAA franchise moved. The Vipers decided to honor the Parker family which had been such a big part of baseball in the city, by holding “Cannons throwback jersey day”. All the Viper players wore special commemorative jerseys with the Cannons logo on it. Growing up, the Cannons were Moro’s favourite team, so it was a special feeling to be able to play with their logo on his uniform. After the game, the jerseys were auctioned off to the highest bidder, but luckily his mother outbid all the fans and he was able to keep this special souvenir. Having mentioned in the local paper what a thrill it was going to be to “play” for the Cannons, Russ Parker sought Moro out after the game to shake his hand, and Moro told him it would be an honour to play for him one day. Just prior to the start of the 2010 season, Moro found out how prophetic that conversation was when he learned he had been traded to the Victoria Seals. He was disappointed to have to leave his friends and fans in his hometown, but happy for the opportunity to play for Parker. And his fan support was evident as when the Seals visited Calgary, many fans came out to cheer for Moro and the crowd was always louder than usual. Moro started the 2011 season playing for the Normal CornBelters of the Frontier Baseball League. But due to financial considerations he was released in the early part of the season and was picked up by the Lake County Fielders of the North American Baseball League. He had some highlights there including striking out 2 batters in his only professional pitching appearance of his career. But there were also many lowlights and other shenanigans. One game had to be forfeited when the team ran out of official balls and could only buy little league caliber balls. The entire team was left stranded in Edmonton and had to go all the way back towards Chicago via public bus. Amidst rumours of bankruptcy, the team canceled a trip to play in Maui just hours before they were scheduled to depart, and finally the team was unable to survive financially and folded. Moro hopes that this is not the way his professional career ends. 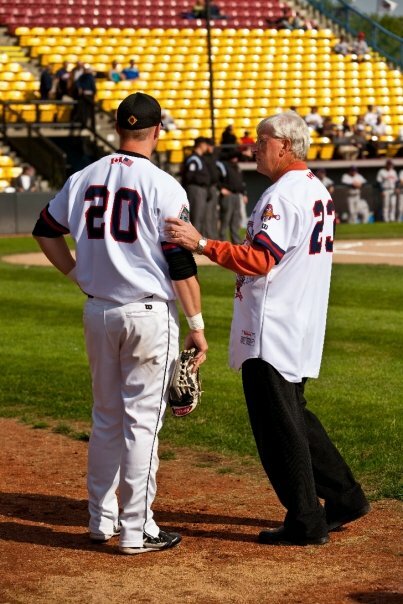 Unsure where he’d play in 2012, Moro spent the winter coaching with the Pro Baseball Force Academy in Calgary. With the Vipers shutting down operations at the end of the 2011 season, Moro looked North to Edmonton to see if the Capitals needed an all-star caliber outfielder. Luckily they did, and he had a plan for this summer. Unfortunately, a few weeks ago the Capitals suspended operations for this season, and there are no professional teams left in Alberta. “With the reduction in Canadian teams, it makes it tougher to find a place to play”, Colin said. “I was lucky that last year US teams were willing to do the paperwork for my VISA, but that’s rare. Lots of other Canadians who were with the Vipers and Capitals last year are in the same situation, looking for a team to play on”. Moro has had a lot of success and has played with and against many great players including Gary Carter, Jose Canseco, Bret Boone, Tony Phillips and many other ex-big leaguers, but he’s not ready to shut it down yet. With any luck, in the next few weeks, Moro will get that call he’s hoping for and won’t have to spend the first spring since 1989 not playing baseball.